Sean Hannity And Jim Acosta Trade Barbs On Twitter - Joe.My.God. 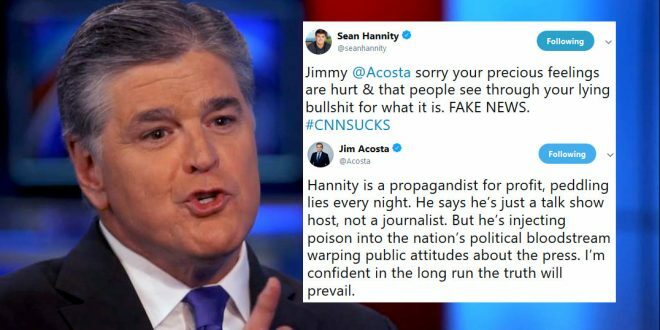 Fox News’ Sean Hannity fired back tonight after CNN’s Jim Acosta called him out on Twitter. Last night and tonight, Hannity criticized CNN’s chief White House correspondent and said he was heckled by Trump rallygoers because he’s part of the “abusively biased” media, adding tonight that he should have been more outraged by harassment of conservatives like Sarah Sanders. After Hannity’s coverage tonight, Acosta took to Twitter to slam the Fox News host.